Increase the productivity of your baking operation by speeding up prep time and shortening cleanup with these convenient pre-cut 6" round dry wax parchment pan liners for cakes. Using parchment paper eliminates the need for grease, and it allows you to remove your cakes after baking with greater ease. Unlike sheets of parchment that you have to cut, these round liners are ready to go right away, saving you time on cutting out individual pieces. Simply place the parchment liner on the bottom of your pan and you're ready to start baking. They're ideal for businesses that produce high volumes of the same size cakes. Each 6" dry wax cake circle is highly grease and moisture resistant, so you'll be able to release your cakes neatly and without hassle, making cleanup a breeze! Better than using foil and it helps to pop the cakes out the pan. Just make sure the wax side of the paper is the one touching the cake batter. After baking the cakes, I use a butterknife around the cake and turn the pan upside down. The cakes pop right out and the only crumbs I need to wash are on the sides of the pan. This round pan liner work perfectly good for me..I used Many times on my cakes at home.. I'm very satisfied with this item..I saved a lot.. They are amazing. No trimming needed. And they work even with my stickiest cake batters. My cake layers come out completely. I’ve even used these without pan spray and had my cakes come out clean. These parchment circles are great! Easy to use, and most importantly, they don’t impart any flavor into the cake. I’ve even used them in large muffin pans in a pinch as cupcake liners. FIVE STARS! This product is AMAZING! The circles make it very easy to release the cake from the pan. The circles are precut and fit nicely into the pan. I want to get the other sizes too now! Definitely, recommend it! These dry wax parchment circles are a welcomed addition to my at home bakery. Prepping tins is no longer a chore. My cakes come away clean and perfectly baked! These are such an amazing deal!!! They are such a time saver and great quality. I love that the packaging allows you to take one liner at a time rather than having to open the entire box. Making baking so much cleaner. Cleaning the pans after baking is so much easier. They are a perfect size and fit any 6 inch round pan perfectly. Cakes come out very clean and with perfect edges. Love how these come off my cakes so easily and come up on the sides just enough to cover the edge. I use them and only spray the sides of my pans. My cakes just pop right out. I use them for my 8 in cakes as well. Highly recommend for any baker! These wax liners make getting cakes out of there pans easy, we have been using them for years. And it makes cleanup a breeze too. These parchment rounds are awesome. Perfectly cut to fit in six inch pan. They are easy release and perform perfectly each time. Saves us a ton of time instead of cutting out paper or spraying pans. This 6 inch parchment paper,but is a little bit over 6 inch,when I put this parchment paper into my 6 inch cake pan,it doesn’t fit perfectly,every time I use I need to cut out a little bit! Absolutely perfect for the 6'' pans...wish we knew about these sooner! We went from having ribbed edges to now the perfect edges on all of our cakes. I use these parchment rounds each and every time it’s make it’s effortless for the cakes to come right out. For the price you can’t go wrong. Why did I ever bother cutting parchment before? These make cake pan prep SO easy and save time/hassle. I will be getting them in multiple sizes. These 6" round parchment pan liners make baking cakes so much easier! The cake releases smoothly from the pan and the clean up is so much easier when we use these liners! They're the perfect size for the small cutting cakes we make for weddings. These parchment liners are great for ensuring that your cakes release easily from the pan. I love it that the box doubles as a dispenser too. The pack of the 6" Round Dry Wax Parchment Pan Liner is so convenient! No need to cut out parchment anymore to line cake pans. Makes it a breeze! There are 2 sides to these parchments and you have to make sure that the shiny side goes towards the cake batter. I like them a lot and highly recommend them. These are the best. So amazing. We were sick of cutting out circles when baking our cakes and wasting parchment scraps. This has made things so simple. Our cakes never stick and they are beautifully brown on the bottom every time. The pack is huge, but these are such time savers. I use them to line every cake pan when baking, and it just ensures that the cake will come out, even if the side get stuck. I have these in many sizes. So nice to have them precut and not to have to add that step to cut them. Great price and so convenient! I have never had a cake stick with these! Love these 6" dry wax liners. They make baking a quick task and cleanup such a breeze. We've tried other brands and have found for the money, these are work as well if not better than other brands for the best economical price. Perfectly priced, good quality parchment liners. Great for using in cake pans, making it an easy release every time. Large quantity means not having to travel to the store every week. These are so great for the bottom of cake pans. We used to cut all of ours by hand and this saves SO much time. The Dry Wax Parchment Pan Liner is a great product. We use them daily in our cake pans for specific recipes. We recommend for sure. Worth buying these to make cake release nice and easy. We sometimes run out and have to cut rounds out of parchment paper. Not fun. Yes, you can get cakes to come out of your pans without using pan liners. It's not pretty, though. The liners keep the cake from sticking to the bottom of your pans. We like these because they fit just about right in most pans. Depending on the brand of cake pan you are using, the liners may come up the side o the pan just a bit. They come off the bottom of the cakes easily, too. Very convenient! Saves you time from cutting your own, plus it fits perfectly on a 6 inch pan! As a home baker, I was afraid this will take a lot of store space in my kitchen, but it doesn't at all! These 6" round dry wax pan liners are a huge convenience to me. I use to cut my circles out of sheets of parchment. Great time saver! Finally! I finally bought these and thank goodness! I find that more people are ordering 6" cakes from me than 8" cakes. I was cutting the 8' parchment rounds to fit a 6" pan. These are perfect. Great item. Even though they are thin they definitely do what they are supposed to do. Live it and glad I bought the whole box. Thanks again. I decided to try these after years of cutting my own paper liners. They are fantastic, nothing sticks and they peel right off. I will definitely purchase these again. Love this product! It' makes baking cakes so easy! No sticking,, no crumble, no mess! If you bake cakes often, this is a great investment. No more burning the bottom of my cakes or drying out..fits exactly on my six inch pans with just a spray of realease..this paper is awesome! Can't say enough about these pan liners - they are fantastic! I used to buy rolls of parchment and cut to fit my pans. Took tons of time and wasted a lot of parchment in the process. These fit the pans and the cakes come out perfectly! So wish I would have discovered these sooner! Parchment pan liners are time saving and money saving. With these liners you simply do not need to add any non stick product of any type to your pans. These came well packaged in a box, so none were bend/disordered. I have found them to be slightly larger than the 6" pans that I have, so they ride up on the edges ever so slightly which is a bit frustrating, otherwise good. This is a good product and I'm very happy with the value. However, several of the liners were folded/scrunched in transit and couldn't be used. Until now, I have been cutting out my own parchment papers from the full sheet papers. Not any more! This saves me so much time and works perfectly every time! I am so glad these actually work. Helps the cake to pop right out of the pan! And much easier then cutting circles from normal parchment paper! These are a wonderful way for us to cut down on time while baking! They work great and meet a high standard! Will put on the top of our list to purchase! Great product. 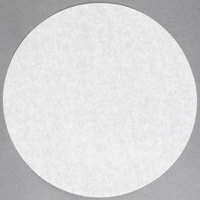 Love this 6" round wax parchment paper liners. They work perfectly when i'm making these cakes. I use them on a regular basis with our bakery. They fit perfectly and save me a lot of time. I was very happy with the fast shipping. Highly recommend not only the product, but also the Webstaurantstore service. These pan liners are so convenient! I don't know about anyone else, but when I use these I often don't even need to grease the sides of the pans. Most of the time I just lay these in the bottoms of the pans and call it good. Could I have bought parchement and cut these myself? Probably. However this is a huge convenience for me and they are very reasonably priced for how many you get. I love these wax paper liners. They are so helpful when I bake cakes. They keep the cake from sticking to the pan and clean up is a breeze!!! This is the most time saving item when preparing pans for baking! A quick spray of Pam and lay the pre-cut parchment in the pan, press down and pour your batter! I love them! I so needed this for my small 6 inch cake pans. I always kept getting cake stuck at the sides and bottom of the pan after release, this helped so much. I have the 6", 9" and 12" for good measure. These are a great buy if you can use 1000! They fit perfectly into the 6" cake pan WEB sells. I don't ever bake cakes without them...Much cheaper here than buying in a store or online. I love the 6" round dry wax pan liners! The pre-cut circles fit in my six inch cheese cake pans. My cheesecakes come right off the pan! I bake a lot of cakes using my 6 inch cake pan and I often wasted so much parchment paper when I made circle liners for those cakes. When I found this product I was very excited because I thought I had finally found a solution to my problem. When they came in I went to use the sheet for my six in cake pans and found that it was too big and I had to cut it down a bit for it to fit. I have also started using the disks for larger size cakes ( 7 and 8 inches) even thought it is smaller than the pan it does what it is suppose to do. These liners are so convenient for baking. Regardless of what I'm making, I just skip them in the bottom of a pan and pour the batter on top. They come out perfect every time. These are basic parchment liners and they work fine. Some of our 6” pans require us to crinkle/push the liner up the sides of the pan but they continue to work well. These pan liners fit perfectly into a 6 inch pan. They help release the cake from the pan easily. They were super easy to use and extremely convenient. No more cutting parchment paper for me! I couldn't love these more. I have the 6" and the 8" and it's a little thing but they make my life so much easier when I'm knee deep in cakes. Love 'em. I use these pan liners for my 6" cakes and cheesecakes. They work perfectly and do the job they are supposed to do. I do suggest that you grease the liner the same way that you would grease the pan though. It helps with release because they are a bit thinner than the parchment you would get in a roll of parchment paper. Great buy. These save so much time and money. I typically bake close to 50 cakes a week and these make it a breeze. You never have to worry about sticking and they make cleanup very quick. These save us a ton of time trimming parchment for cake pans. The only issue is that they are little larger than your standard cake pan, so there is a little overlap that can cause issues when topped with batter. Overall, they are great though. These are great! i can't bake a cake without having one of these in the pan. You'll know your cake is going to come out beautifully and won't have to worry about sticking to the bottom. No more need to laboriously cut wax paper! saves a lot of time for our small baking business. Thanks for providing such products at such reasonable prices. You would never think of this until you have to bake cakes for a business. It's so easy to slide these into the bottom of the pans so that you have no worries about cakes sticking in the pan but you don't have to cut them out one by one. These are such time savers. I used to stand in the kitchen trying to measure and cut out the circles I needed for the bottom of my pans. As soon as I received these I fell in love. Can't live without them now. great !!! on these boards you don't have to worry about the oil from the cake or icing getting on the boards, you can cover the boards with icing which make it look very nice. These cake circles are perfect for baking cakes to prevent the cake from tearing because it stuck to the pan. I wish I had bought them in the 8" size too. The paper is thinner than I expected and takes some effort to peal off the bottom of the cake after baking. I thought these would be more non-stick than they are. WOW. I love the 6" wax circles. I have always cut my own circles but will never again. This is the fastest and most economical way for wax circles.